TRE巴德是岘港的猪肉制成的特殊料理. It has become not only the favourite cuisine of many local inhabitants but also a tasty dish that the people from all over the country love. 在岘港, Tre Ba De is something similar to a “snack”. It is a spicy food that anyone ever tasted would never forget the mouthwatering flavour. 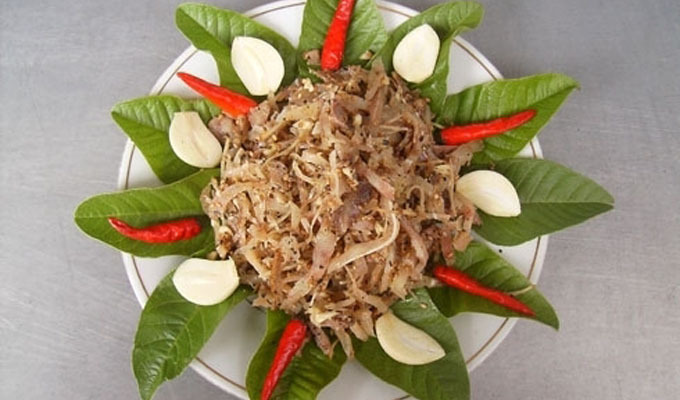 首先, Tre Ba De looks like another famous dish that is really popular in the Northern part of the country called Nem Chao. 然而, Tre Ba De is cooked ways differently. The main ingredients include the meat and the skin of the pig. They are then sliced into small stick-shaped pieces and mixed with garlic and galingale. The mixture is kept covered from two to three days until it has the unique and intriguing smell of fermented pork, galingale and garlic. A good Tre Ba De dish must be wrapped in banana leaves and guava leaves, which boost the fragrance and make dish taste better.